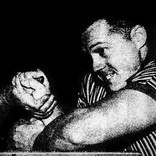 The 1960s were the early days of organized armwrestling. Annual tournaments had been held in Petaluma, California since the mid-‘50s, and in 1962 in the city hosted the first World’s Wristwrestling Championship (WWC). The WWC was the biggest event by far in the ‘60s and it became universally recognized as the tournament to win if you wanted to be known as the best puller in the world. But a new organization emerged around the middle of the decade which also offered a World title: the International Federation of Arm Wrestlers (IFAW). The IFAW hosted armwrestling tournaments in conjunction with major bodybuilding contests, such as the Mr. Olympia. Unfortunately, none of the top competitors from these organizations competed in both World Championships during the decade, so we are left to wonder who the very best pullers were. But I have my opinions. The following are the top 10 pullers of the ‘60s and why I think they deserve to be on this list. ​A former Mr. America, Jimmy Payne won the lightweight world wristwrestling championship title in 1964, the first year the division was offered. It was also the first time he competed in a wristwrestling contest. He won the title again in 1966. Unfortunately, his performances were inconsistent from year-to-year, which prevents him from appearing higher up on this list. ​A mercury miner from Sebastopol, California, Rich was the 1966 Middleweight World Wristwrestling Champion and the runner-up in 1969. His only known losses during the decade were to Jim Pollock, who is also on this list. 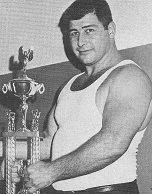 ​A 6’5”, 300-lb hod carrier from Penngrove, California, Larry Finley was the 1967 Heavyweight World Wristwrestling Champion and the runner-up in 1969. An extremely efficient puller, he disposed of most opponents in less than a second. His only losses were to Mike Rowe and Duane “Tiny” Benedix, both on this list. ​Californian Lloyd Lampton was the winner of the first two tournaments organized by the International Federation of Arm Wrestlers, including its inaugural World Arm Wrestling Championship in 1966. Lloyd was a 6’8” shoulder presser who smashed all of his opponents’ arms down. Unfortunately, he retired from competition after just two events, and he never matched up with the best of Petaluma. But his size and style lead me to believe he would have been a handful for anyone. ​Petaluman Jim Dolcini first competed in the World’s Wristwrestling Championship in 1966 at the tender age of 15! He lost to Richard Kennedy that year in the middleweight division, and was runner-up to Jim Pollock in the 1967 event. He won the title on his third try in 1968, defeating Jim in the finals. By age 18 in 1969, Jim was too big to compete in the middleweight division, but he held his own with the heavyweights, making it to the later rounds of the contest. ​A successful insurance broker from Palo Alto, California, Jim Pollock won the middleweight world wristwrestling title in 1967 and 1969. His only loss of the decade was to Jim Dolcini in the finals of the 1968 event (he beat Dolcini in the 1967 finals). Mr. Pollock was one of the first pullers to approach the sport scientifically, carefully considering what he ate, how he trained, and the importance of mental conditioning as well. ​Mike Rowe only competed in one event in his entire wristwrestling career: the 1966 World’s Wristwrestling Championship. But he made quite an impression. He dethroned the 1965 Heavyweight World Champion, Arnie Klein, and also beat the hugely impressive Larry Finley. Mike did not return to defend his title in 1967. He had enlisted in the Marines and was believed to be overseas at the time. No one knows quite how strong Mike really was, but most would agree the answer is “very”. Though his results and situation are comparable to Lloyd Lampton’s he ranks higher because his wins were earned against a more established field of competitors. ​5’8” Earl Hagerman won the California wristwrestling title in 1960 and the inaugural World’s Wristwrestling Championship in 1962. Both of these contests featured a single open weight class. Earl, weighing just north of 200 lbs, gave up a significant amount of weight to many of his opponents. Once three weight classes became the norm in 1964, he won the world title in the middleweight division, and he won it again in 1965 (which would be his final contest). 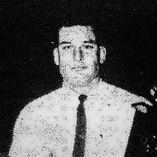 In 1961 and 1963, he was runner-up, with both of his losses coming against Duane “Tiny” Benedix. 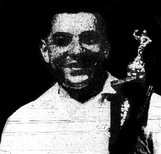 Earl is the only person to register a pin on Tiny, which occurred in the finals of the 1962 event. ​After making a name for himself through his armwrestling exploits in lumber camps in his teens and twenties, Bristol, Connecticut’s Maurice “Moe” Baker finally entered an official contest in 1968 at the IFAW World Arm Wrestling Championship in New York City. He proved to be way ahead of the rest of the field, absolutely demolishing his opponents. He won the 1968 contest and returned to easily defend his title in 1969, to finish the decade with an unblemished record. While he did not face any west coast pullers in the late ‘60s, the top east coast pullers of the era attended these IFAW contests, and Moe beat them all. ​Duane “Tiny” Benedix competed in Petaluma five times: in 1961, 1962, 1963, 1968, and 1969. The 6’4” Livermore, California native won the unlimited title in each of these years, with the exception of 1962 when he lost the controversial final match against Earl Hagerman (Earl supposedly started before the official command, but the referees refused to restart the match). He easily defeated his opponents, including the great Larry Finley in the 1968 and 1969 events. It is difficult to say who would have won a match between Tiny and Moe in the late ‘60s. But I give Tiny the top spot on this list because the Petaluma events attracted more entries than the New York City IFAW events, and Tiny was a proven performer in official contest settings throughout the entire decade. ​Mickie Novas, a secretary from Oakland, California, won the women’s world wristwrestling title three times in a row between 1967 and 1969. No other competitor came close to matching her performance during the decade.